Bill and his daughter untied the horses and rode them down to the beach. My newly purchased sled dogs, still chained inside the boat, yapped and barked crazily at the Icelandic Ponies. The dogs had never seen horses before and their excitement maddened Bill. “I won’t tolerate the dogs barking at the horses!” he yelled with spittle flying from his lip. He grabbed a loose harness and tried whipping the dogs from shore. The dogs cowered and instinctively went mute. We were 26 miles across the bay, northeast of Kotzebue, Alaska. 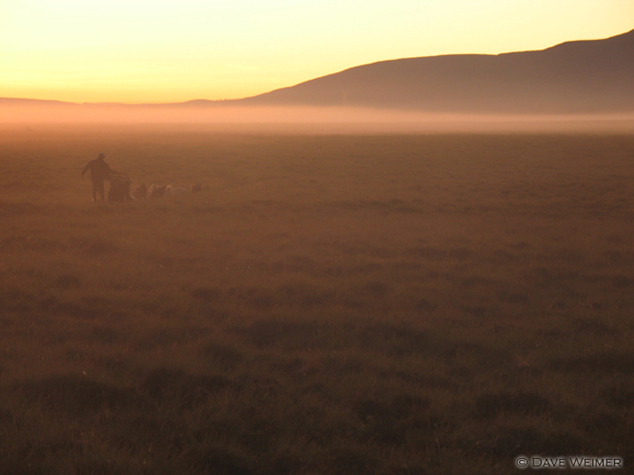 From that point, camp lies another 2 miles inland and we would need to cross the tundra to get there. Bill and the kids rode the horses and I anxiously harnessed my team for the first time to see how they’d pull. I bought these particular dogs from a musher named Chad Nordlum whose father Roger Nordlum is of Iditarod fame. 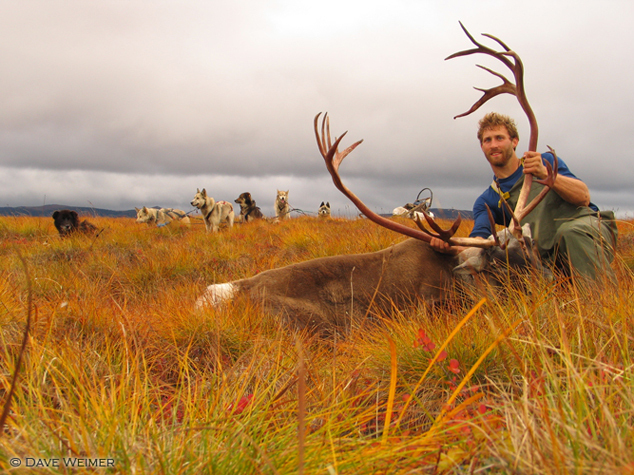 Chad had a new girlfriend in Anchorage and after being disqualified from a race known as the Kobuk 440 he wanted out of dogs and hadn’t run them in over a year. So, as you might imagine, when I got them they were fairly weak. 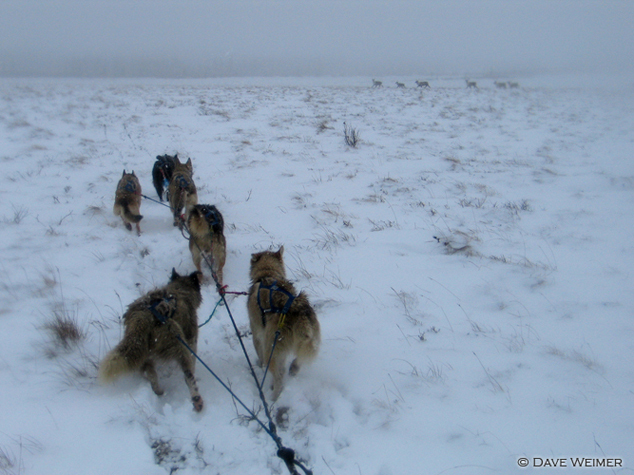 I anchored the sled to the gravel beach and from front to back harnessed the dogs. First my leader, Wiley, then in swing position the twin sisters Sapphire and Saluka. Next went Orion in team, then Chuck and Husky in wheel position nearest the sled. They didn’t lunge or scream as sled dogs often do when they are about to pull, and for a split second I thought maybe they’d forgotten how. But as soon as I gave the command, “Hup!” and gave the sled a little push, they instinctively threw their weight into the harnesses and pulled me along from the back of the sled at heart-stop speed. The desire to pull was in the dog’s blood, they couldn’t forget what they were born to do. The trail we were supposed to take was hard to find and I gave my leader commands, ‘Gee’ and ‘Haw’ (right and left) as to where I wanted him to take us. He didn’t seem too keen on listening however and tried several times to take us back the way we’d come. I thwarted his attempts and then tried to run Orion next to him in double-lead to see if that would work. Orion isn’t supposed to know commands (as his previous owner told me) but he seemed to understand exactly what I was saying and dragged Wiley around like a disciplined school boy. We found the wrong trail, the horse trail instead of the sled one and it was badly rutted and made for hard pulling. The dogs were all doing very well despite their year long hiatus. One dog in particular though stood out. 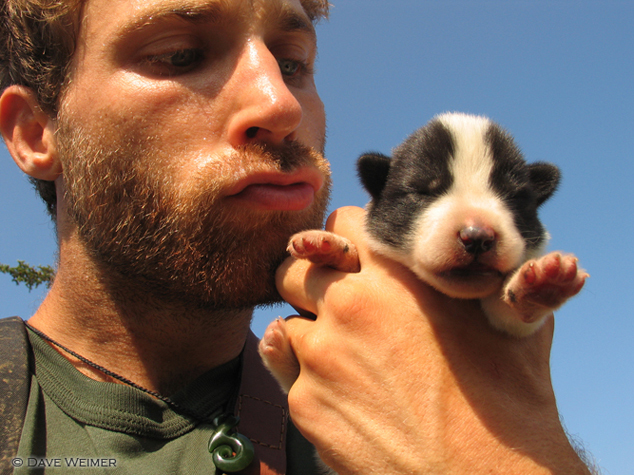 Chuck pulls the way a musher dreams a dog to pull. Chuck pulls as hard as he can ALL the time. He’s ‘honest’ as they say. Even when I’m stopped and the other dogs are resting, Chuck is trying to rip the anchor out. Naturally, I fell in love with him. My very first day running dogs and there I was, already falling in love with them. I had previous experience with sled dogs. 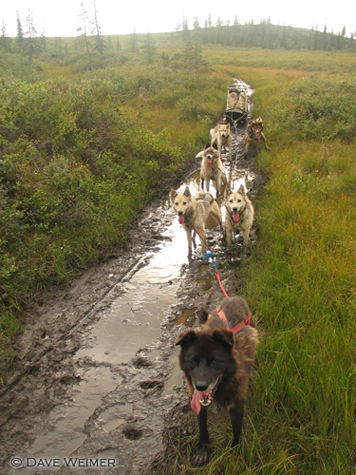 I ran dogs for the first time in Kotzebue ten years ago and I mushed professionally as a tourist guide in Snowmass, Colorado. All told I’d probably worked intimately with a few hundred sled dogs. But of all those wonderful characters, these dogs were different. These were MY dogs. Yes, yes, there were only six of them. These days a musher would laugh at a guy with only six dogs. In fact, Bill had 130. Serious mushers today who run races like Iditarod or Yukon Quest generally have around 60-80 adult sled dogs. In the past, when the definition of ‘net-worth’ had to do with how good a hunter you were, the more dogs you could feed was living proof of how wealthy you were. The truth of the matter is- sled dogs aren’t cheap. From July until December I plan on feeding 50 bags of high quality commercial dog food supplemented with bucket fat. For 6 dogs, I’ve spent $2,400 dollars to feed them for just 6 months. Yes, I’m serious! Bill for instance, maintains a kennel of over 100 sled dogs and pays annually $23,000 dollars for 15 tons of dog food, which is going in one side the dog and coming out the other. Considering one of my chores is to shovel poop, I figure I’ll chuck about 7 tons worth- WHEW! Currently, Bill is one of the top long distance mushers in the sport today. Last winter his prize earnings totaled $89,000! This is quite a feat considering he lives in the bush. Keep in mind, his total annual COSTS are around $40-$50,000 just to maintain his kennel, and get him, his dogs and gear, to and from the races. And that’s where the problem lies. You see, one is not guaranteed to win races. Even Susan Butcher, who won the Iditarod 3 times, had to scratch from a race one year when a moose stomped her team. She still had to feed those dogs. Running dogs though isn’t about winning races. It’s a lifestyle. Bill and I visited the Kotzebue general store to get a few odds and ends. It’s one of the three places you can get gasoline in town and a man came inside after filling his tank jabbering on about how high the gas prices were. 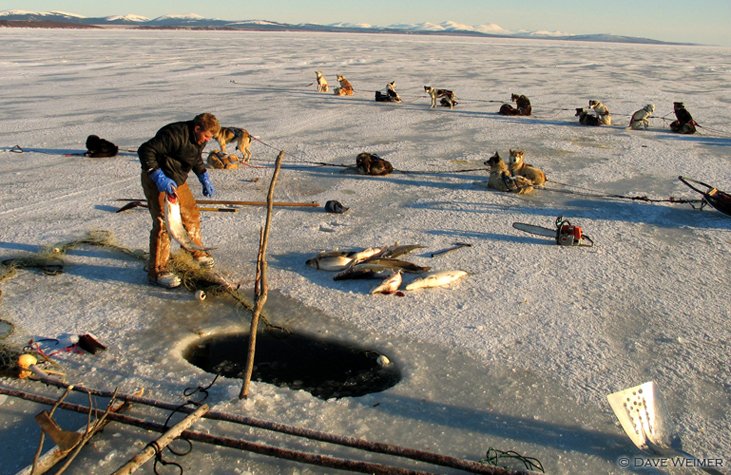 Above: Using set nets to catch Sheefish under the ice, Kotzebue Sound.